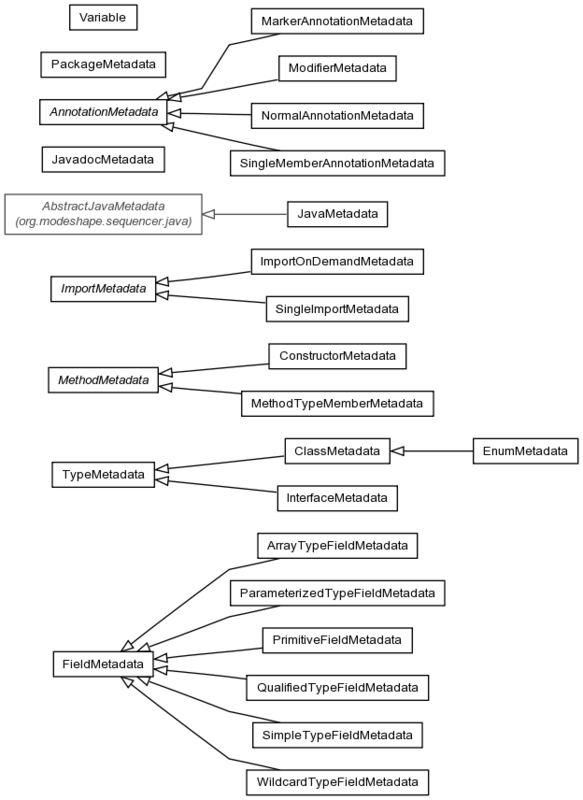 The classes that make up the metadata definitions for the Java source file sequencer. AnnotationMetadata Abstract class for annotations. ArrayTypeFieldMetadata ArrayTypeFieldMetadata represents the meta data for an array type. EnumMetadata Metadata for Java enums. FieldMetadata FieldMetadata is the base class of all fields. JavaMetadata Metadata for a Java source file. MarkerAnnotationMetadata Metadata for marker annotations. MethodTypeMemberMetadata Metadata for method type members. NormalAnnotationMetadata Metadata for normal annotations. ParameterizedTypeFieldMetadata ParameterizedTypeFieldMetadata is a meta data for a parameterized type. QualifiedTypeFieldMetadata QualifiedTypeFieldMetadata meta data for a qualified type. SimpleTypeFieldMetadata SimpleTypeFieldMetadata is a meta data for simple class type reference , a simple interface type reference, or a simple type variable. SingleMemberAnnotationMetadata Metadata for single member annotations. TypeMetadata Exposes meta data of a top level type. WildcardTypeFieldMetadata WildcardTypeFieldMetadata represents meta data for wild card type.